It’s no secret that the right tools make all the difference, and Superior Machining and Fabrication Inc. in Muenster, Texas, knows that better than most. A company that built its own facility from the ground up in a town founded on a do-it-yourself (DIY) German ancestry, Superior manages nearly every aspect of its manufacturing process, enabling it to better predict project times and manage costs. Working with clients from the aerospace, oil and defense industries, Superior had previously been conducting its work on vertical machining centers. 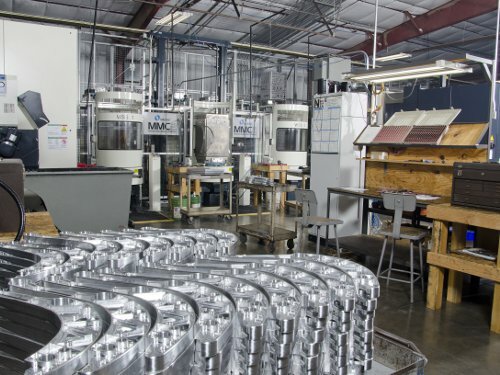 Over time, this job shop saw the advantages brought about by horizontal machining centers as too good to pass up; however, its prior machine tool provider couldn’t keep pace with production requirements. Superior needed a reliable partner with the capacity and capability for new automated machine tools. As the aerospace industry continued to grow in the early 2000s, owner Giles Walterscheid saw an opportunity to grow with it and knew Superior didn’t have time to wait. It was then that the company turned to Makino to provide the high-speed equipment it needed to move into a production operation. Superior purchased three Makino a51 horizontal machining centers, and it immediately saw the advantages. This high-speed equipment greatly improved tool changes and cutting speeds, and it boosted reliability in Superior’s operations, bringing more reliable spindles and less money spent on replacements. The company soon bought three more a51 machines. After years of success with the a51 machines, when Superior needed a larger work zone to produce parts in a single setup, it purchased five Makino a61nx horizontal machining centers and a Makino MMC2 automated cell. Operators underwent technical training at Makino’s Mason, Ohio, facility to operate these automated machine tools, while the MMC2 system was being installed back home. Later, Superior purchased two Makino PS95 vertical machining centers for one-off jobs that required a vertical platform. This equipment replaced the company’s former commodity machines. With this new equipment, Superior is experiencing productivity and growth like never before. The pallets featured in the automated machine tool system can be loaded and unloaded without stopping the machine. With its high-speed equipment, Superior has transformed itself from a job shop to more of a production environment, shipping over 40,000 parts per month. On one particular application, the company can produce enough extra parts per machine, per day, that it is bringing in nearly $2 million in extra revenue each year. Superior’s PS95 machines have brought longer tool life and faster feeds, saving 10 to 15 percent over the company’s previous machines. Flexibility and productivity are key attributes for Superior Machining and Fabrication. With the help of its high-speed equipment and automated cells, the company is producing parts at a greater rate than it has ever seen.